Veggie Terrain: Eggs? Not for This Chick. Eggs often play a structural role in cooking and baking. They act as a leavening agent, are used to add volume, and are added to help bind ingredients together. Accordingly, the type of dish that you're preparing will often determine what type of egg substitute (if any) is appropriate to use. 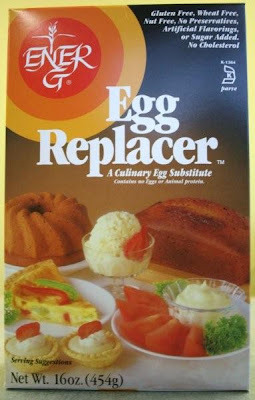 As such, working with egg-substitutes sometimes seems like an even bigger challenge than replacing the dairy products in one's diet. However, with a little creativity and some practice, you'll quickly find that it's easy to enjoy healthy and delicious egg-free baking and cooking! Note: Most of these products can be found at your local grocery store. They can also be found at stores like Trader Joe's and Whole Foods, and might even be sitting in your kitchen right now! Not surprisingly, most people instinctively associate eggs with baked goods. And since those of us who like baking typically love to share the fruits of our labor, it's common for egg-laden foods to take center-stage at holidays and other celebrations. This means that baking without eggs often presents a great opportunity to expose others to delicious vegan (or simply egg-free) goods. Since people are generally willing to try all types of desserts, those who might not give other vegan dishes a chance are likely to taste (and find that they enjoy!) vegan sweets. Mix 1 1/2 tsp of Ener-G Egg Replacer with 2 Tbs of warm water; use as a direct substitute in baking. Ener-G works for all types of baked goods. It is powdery in texture, and white in color. Tip: An easy way to prepare Ener-G is to place the egg substitute in a small dish, add the water, and then whisk both ingredients with a fork until they become frothy. This mixture is similar to Ener-G, and is equally as versatile. Again, this works similarly to Ener-G (and the cornstarch mixture), it also gives a healthy boost of Omega 3s to whatever you're making! This mixture is convenient to use because it consists of things that people probably already have in their cupboards. 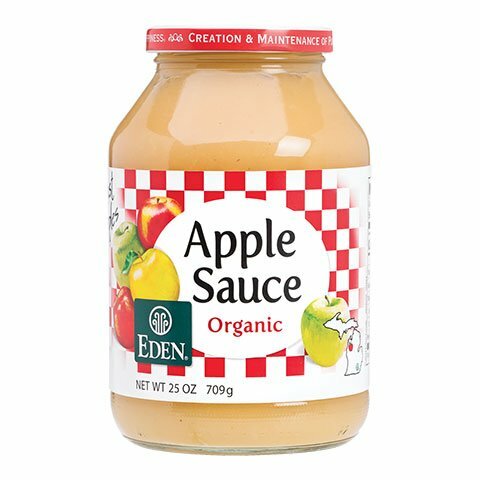 Applesauce and prunes work well in cakes, brownies, and muffins. Note: fruit-based substitutions might add a bit of flavor to your recipe, so don't forget to consider that when using them. Bananas work well in cookies, muffins, pancakes, and quick breads. They are also good for "browning" purposes. Yogurt works well in cakes, muffins, and quick breads. Recipes often include eggs because they require an ingredient that acts as a binder, in order to keep other ingredients in the dish together. Some examples of these types of foods are: burger patties; casseroles; "meat" balls; and veggie loaves. As a result, the type of egg-substitute that you use should be determined by the type of dish that you're cooking, the amount of "stick" that you need, and the flavor that the replacement product will add to your particular recipe. Typically, 2 - 3 Tbsp of a single one of the following ingredients will replace one whole egg in a recipe. Keep in mind that just as when working with dairy substitutes, a little experimentation goes a long way toward perfection!